Ginnie Mae’s simple, effective business model exemplifies the power of the Federal Government and the private sector working together. The efficiency of our platform and our single security allows Ginnie Mae to fund the needs and demands of various market segments by leveraging the full faith and credit of the U.S. Government to access global capital. The Ginnie Mae model significantly limits the taxpayers' exposure to risk associated with secondary market transactions. Its strategy is to guarantee a simple pass-through security to lenders rather than buy loans and issue its own securities. Because private lending institutions originate eligible loans, pool them into securities and issue Ginnie Mae mortgage-backed securities (MBS), the corporation's exposure to risk is limited to the ability and capacity of its MBS Issuer partners to fulfill their obligations to pay investors. By guaranteeing the servicing performance of the Issuer — not the underlying collateral — Ginnie Mae insulates itself from the credit risk of the mortgage loans. 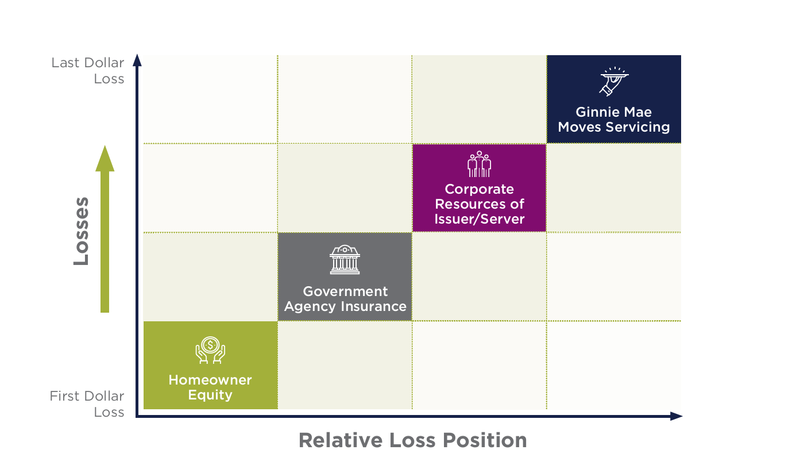 As you can see, Ginnie Mae is in the fourth loss position and is at risk only when all three of the preceding layers of risk protection are exhausted or fail. Additionally, the failure of an Issuer will cause Ginnie Mae to experience financial loss only to the extent that funds are needed to transfer the servicing to another Issuer or to the extent there is deterioration in servicing value.